Written on November 10, 2006, and categorized as Secret and Invisible. At a recent visit to the Byam Shaw school of art, up at the top of Holloway Road, Archway, I found this poster advertising an exhibition, which tells half a joke. 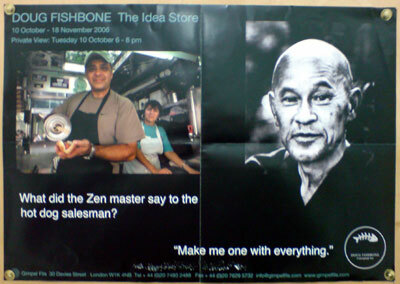 Q: What did the Zen master say to the hotdog salesman? A: Make me one with everything. I feel oddly serene after reading that post.